ATTOM Data Solutions, curator of the nation’s premier property database, today released its Year-End 2018 U.S. Home Equity & Underwater Report, which shows that in the fourth quarter of 2018, over 14.5 million U.S. properties were equity rich — where the combined estimated amount of loans secured by the property was 50 percent or less of the property’s estimated market value — up by more than 834,000 from a year ago to a new high as far back as data is available, Q4 2013. The 14.5 million equity rich properties in Q4 2018 represented 25.6 percent of all properties with a mortgage, down slightly from 25.7 percent in the previous quarter but up from 25.4 percent in Q4 2017. The report also shows more than 5 million U.S. properties were seriously underwater — where the combined estimated balance of loans secured by the property was at least 25 percent higher than the property’s estimated market value, representing 8.8 percent of all U.S. properties with a mortgage. That 8.8 percent share of seriously underwater homes remained unchanged from the previous quarter and down from 9.3 percent in Q4 2017. States with the highest share of mortgages that were seriously underwater included; Louisiana (20.8 percent); Mississippi (16.9 percent); Arkansas (15.9 percent); Illinois (15.6 percent); and Iowa (15.2 percent). Among 98 metropolitan statistical areas analyzed in the report, those with the highest share of mortgages that were seriously underwater included; Baton Rouge, Louisiana (20.7 percent); Youngstown, Ohio (19.0 percent); New Orleans, Louisiana (19.0 percent); Toledo, Ohio (18.0 percent); and Scranton, Pennsylvania (17.7 percent). Among 7,590 U.S. zip codes with at least 2,500 properties with mortgages, there were 27 zip codes where more than half of all properties with a mortgage were seriously underwater, including zip codes in the Chicago, Cleveland, Saint Louis, Atlantic City, Detroit and Virginia Beach metropolitan statistical areas. The top five zip codes with the highest share of seriously underwater properties were 08611 in Trenton, New Jersey (70.3 percent seriously underwater); 63137 in Saint Louis, Missouri (64.8 percent); 60426 in Harvey, Illinois (62.3 percent); 38106 in Memphis, Tennessee (60.5 percent); and 61104 in Rockford, Illinois (59.6 percent). States with the highest share of equity rich properties were California (43.6 percent); Hawaii (39.3 percent); New York(34.2 percent); Washington (34.2 percent); and Oregon (32.9 percent). Among 98 metropolitan statistical areas analyzed in the report, those with the highest share of equity rich properties were San Jose, California (72.0 percent); San Francisco, California (60.7 percent); Los Angeles, California (48.5 percent); Honolulu, Hawaii (40.2 percent); and Oxnard, California (39.2 percent). Among the 1,479 counties with at least 2,500 properties with mortgages, those top 10 counties with the highest percent of equity rich properties resided mainly in California counties. The top five counties with the highest share of equity rich properties were San Mateo, California (75.9 percent); Santa Clara, California (73.0 percent); San Francisco, California (71.4 percent); Pasquotank, North Carolina (65.7 percent); and Alameda, California (62.7 percent). Among 7,590 U.S. zip codes with at least 2,500 properties with mortgages, there were 427 zip codes where more than half of all properties with a mortgage were equity rich. The top five zip codes with the highest share of equity rich properties were all in the California Bay area: 94116 in San Francisco (85.0 percent); 94087 in Sunnyvale (84.6 percent equity rich); 94040 in Mountain View (83.5 percent equity rich); 94043 in Mountain View (83.0 percent equity rich); and 95051 in Santa Clara (82.7 percent equity rich). The ATTOM Data Solutions U.S. Home Equity & Underwater report provides counts of properties based on several categories of equity — or loan to value (LTV) — at the state, metro, county and zip code level, along with the percentage of total properties with a mortgage that each equity category represents. The equity/LTV is calculated based on record-level loan model estimating position and amount of loans secured by a property and a record-level automated valuation model (AVM) derived from publicly recorded mortgage and deed of trust data collected and licensed by ATTOM Data Solutions nationwide for more than 155 million U.S. properties. Seriously underwater: Loan to value ratio of 125 percent or above, meaning the property owner owed at least 25 percent more than the estimated market value of the property. Equity rich: Loan to value ratio of 50 percent or lower, meaning the property owner had at least 50 percent equity. Sotheby’s International Realty Affiliates LLC announced the highest annual return in history in 2018, with its partners reaching a total sales volume exceeding over 112 billion dollars. 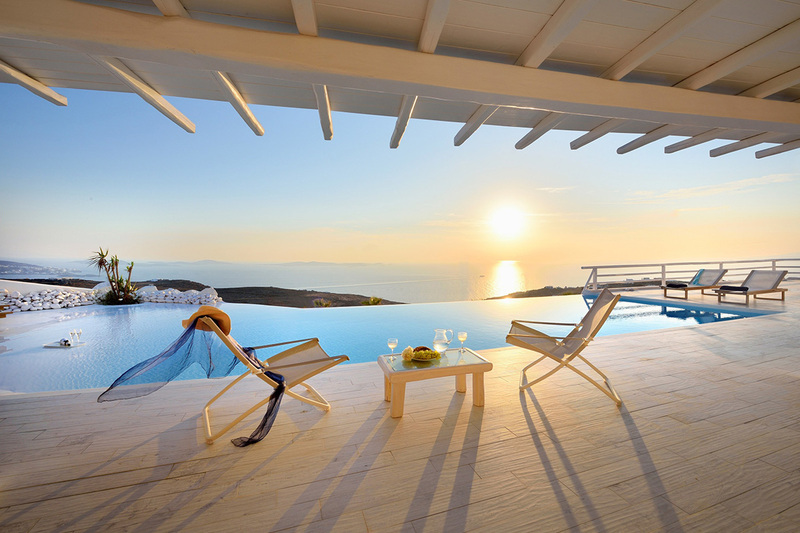 Greece Sotheby’s experienced one of the highest growth rates worldwide, greatly consolidating its leading position in the local market. Sotheby’s International Realty continued to grow in major European markets during the financial year 2018, such as Spain, Germany, Austria, Slovakia and Switzerland. At the same time, 2018 saw the sale of its rights in Cyprus. In Asia, new offices were inaugurated in Sri Lanka and Thailand, while expansion agreements were signed in Indonesia, Vietnamand the Maldives. Despite the loss in the value of many digital currencies and particularly Bitcoin in the past year, data from Statista indicates that the number of cryptocurrency wallet owners has increased 32% and reached 31 million by the end of 2018. 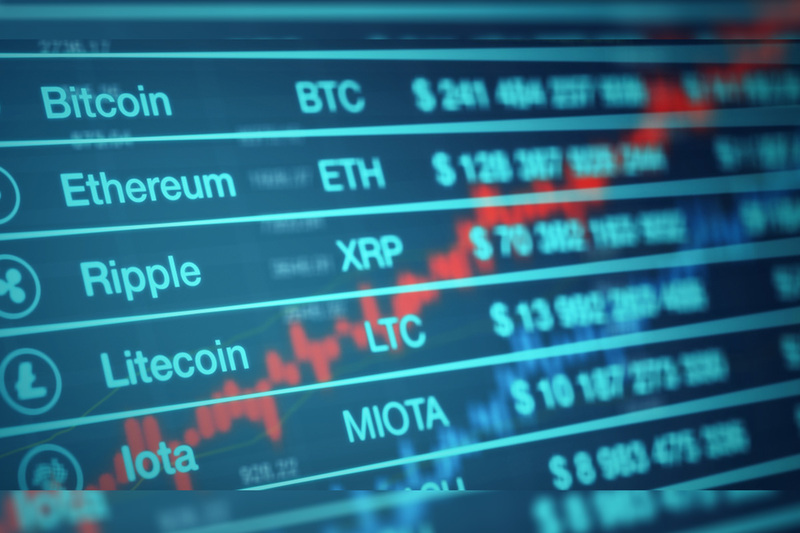 Widely used in many industries including automotive, travel and informatics, cryptocurrency has also become widespread in the real estate sector. Leading companies in the world such as Microsoft, Virgin Atlantic and Shopify now allow users to make payments in cryptocurrencies for their products and services. The real estate sector has also experienced an increase in the use of digital currencies and it is now possible to buy houses with cryptocurrency in Turkey, a home for many foreign investors. With a total market value of 140 billion dollars, cryptocurrency is actively used in travel, food, information technologies, automotive as well as real estate sectors. As one of the most attractive European countries for housing investment where 40 thousand properties has been sold to foreigners in 2018, Turkey uses not only Bitcoin (BTC) but also Ripple (XRP), Ethereum (ETH), Bitcoin Cash (BCH), Bitcoin Gold (BTG), Litecoin (LTC), Tether (USDT) and Stellar (XLM) for house sale transactions. Antalya Homes, the leading international real estate agency, which has helped thousands of foreigners obtain a home in Turkey to date, adopted an innovative approach selling nine houses in 2018 using Bitcoin (BTC). 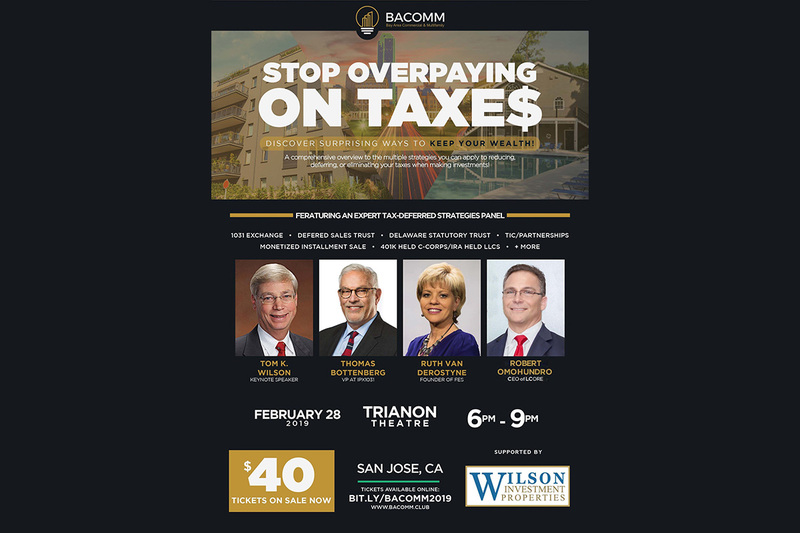 The Bay Area Commercial & Multifamily (BACOMM) Investment Club is organizing STOP OVERPAYING ON TAXES: Discover Surprising Ways to Keep your Wealth, at the Trianon Theatre in Downtown San Jose on Thursday, February 28 from 6 - 9 PM. he Bay Area Commercial & Multifamily (BACOMM) Investment Club is organizing STOP OVERPAYING ON TAXES: Discover Surprising Ways to Keep your Wealth, at the Trianon Theatre in Downtown San Jose on Thursday, February 28 from 6 – 9 PM. Right now, we are at the peak end of the longest economic expansion in our nation’s history, and many investors are looking to sell off highly appreciated assets to re-invest, or just to hold on to cash. 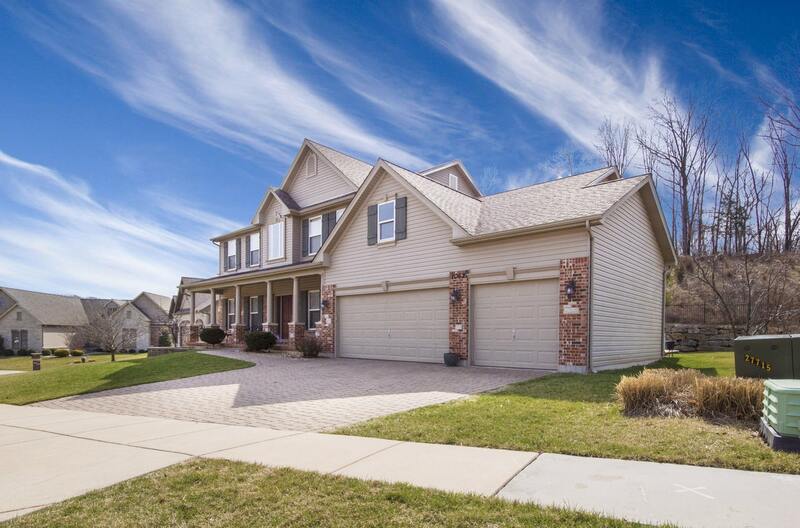 The problem is that capital gains taxes can eat up to 50% of hard earned gains, and many investors do not know that they have options, so they are not selling their primary residences, investment properties, stocks, and businesses. This flagship community event brings together three experts who represent a wide range of capital gains deferral strategies, including 1031 exchange, Delaware Statutory Trust, Deferred Sales Trust, Monetized Installment Sale, Conservation Easements, Opportunity Zones and much more. Some of these strategies even allow investors to legally defer gains from the sale of one asset to non-like kind assets. Event tickets are only $40. To learn more about the event, or how you can promote your business, please visit bit.ly/BACOMM2019. Bay Area Commercial & Multifamily (BACOMM) is a real estate investment club that caters to investors of all experience levels looking to advance from rental homes and move up to the big leagues of commercial and multifamily real estate investing. Members will also have the opportunity to invest passively in institutional grade investments for as little as $50k.